We live in an amazing world that is changing quickly. Numbers are one way to grasp what it all means, and the web is full of them. Whether you’re writing a paper for school, putting together a post for your blog or just trying to win an argument with a friend, knowing where to find the international statistics can make all the difference. Population, GDP, Internet usage and fertility rates are all part of the larger story of where humanity is heading. There’s no end of out-of-context information on blogs and websites, so it’s important to find raw sources of information. You know, information from a primary source instead of an aggregate source. This information empowers you to draw your own conclusions, instead of leading you to them. I’ve highlighted a few such sources below, so let’s check them out. The various branches of the United Nations create staggering amounts of international statistics on a regular basis. Data.un.org gives the people of earth access to this information. Check out UNdata and you’ll see a simple search engine database, as well as a selection of the newest information. Run a search and you’ll quickly notice there’s a lot of information here. The search engine interface makes finding the information you’re looking for quick, though the amount of information there can be overwhelming. Check this site out if you’ve got a particular statistic in mind. If you’re looking for an overview of a certain country you should really check the CIA World Factbook. This site provides the basic numbers of every country and territory on Earth, including a brief history and more stats than you probably need. Go ahead and check out the World Factbook right now. You an even browse the world’s countries by flag. If you’re anything like me you’ll even stumble upon territories you didn’t know existed (like this tiny French territory south of Newfoundland). You will then spend far too much time reading about them. This one’s a great collection of Internet usage stats from around the world. The digital divide is a well-publicized phenomenon; these numbers can give you a fantastic amount of context for it. All the information they have is cited, offering a look at where the world’s Internet users reside. Information is broken down by continent, so be sure to explore a bit to find out how your country ranks. Go ahead and check out Internet World Stats. This overview is a great way to quickly find stats such as population or GDP. Not sure if you can trust Wikipedia? Any article worth its word count is heavily cited, so check the article’s source to find out where it’s coming from. Numbers, like quotations, can be taken out of context. That’s the point Mark Twain was trying to make when he mis-attributed “Lies, damned lies and statistics” to the 19th Century British Prime Minister Benjamin Disraeli. This doesn’t mean numbers are useless, though; just that you should fact check them. These sources give you the chance to do just that, but there must be more sources out there. Feel free to share any you know of in the comments below, or to share any interesting numbers you might stumble upon. Oh, and by the way: the chart at the top of this article represents the top ten countries in a certain category. Feel free to offer guesses below! Top ten countries for cell phone ownership. No one's gotten it yet, so I think I'll reveal the answer tomorrow for anyone who might be interested. Stay tuned! Top 10 software exporting nations. Top 10 growing IT markets. Top 10 markets for electronics. No, but you're closer than anyone else so far. Most powerful countries and that is my final answer. Oh, sorry, that's not correct. And with all three lifelines left even! Top ten lovers of Obama by country? Top ten users of Google? Top ten holders of American debt? Nice try, but wrong on all counts. Here's a hint: it's technology-related. No, that's not either. Let me know if you guys need a hint. 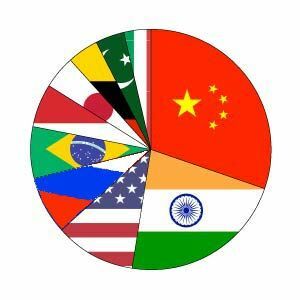 The pie chart represents population of top 10 countries. Nice guess, but no. Anyone else?